Location: Whitby, North Yorkshire, England. Ownership / Access: Marquess of Normanby. 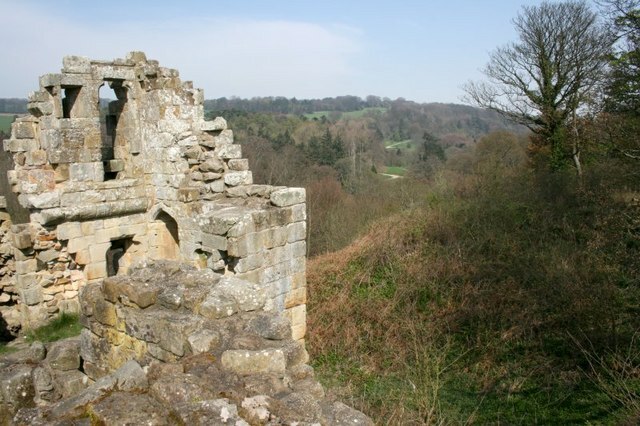 Notes: Mulgrave Castle refers to one of three structures on the same property in Lythe, near Whitby, Yorkshire, England. One of these, known as the "old" or "ancient" castle, was by legend founded by Wada, a 6th century ruler of H�lsingland. The second castle, (54.4935�N 0.7055�W) caput of the feudal barony of Mulgrave, was of Norman construction and remained active until destroyed by order of Parliament in 1647. The third is a country house (54.5012�N 0.6922�W) which was constructed by Lady Catherine Darnley and passed in 1718 by marriage into the Phipps family, when her daughter Lady Catherine Annesley married William Phipps. The Phipps family later held the titles of Baron Mulgrave, Earl of Mulgrave and Marquess of Normanby. The 19th century "Handbook for Travellers in Yorkshire and for Residents in the County" recounts that the ancient castle was built by Wada, ruler of H�lsingland. Leland in his "Itineraries", circa 1545, refers to several local legends supposing Wada to have been a giant who built many castles and roads in Yorkshire.